Mind Garbage: Countdown to Comic Con - 3 Weeks to Go! Guys I can't believe it's only 3 weeks until comic con eve, which I get as excited for as I do Christmas eve. There have of course been more guest announcements, and oh my god, David Duchovny! I was never a big X-Files person, but he was absolutely amazing in Californication (which if you haven't seen I would highly recommend, unless you don't like vulgarity, in which case it's definitely not for you). So, I've made a little bit more progress on my cosplay this week. As you know, last week I had only managed to make some of the hair bits, this week I have slightly more to report, although I still have a long way to go. I have spent so many hours online trying to find a hoodie that's the right colour and had no luck at all, so I finally realised, after a comment from a friend, that the best way to do it might be to get some dye and do it myself, so I have a plain white hoodie and ordered some dye, so hopefully next week I'll have a hoodie to show you all. This week has been a really busy week, so I haven't managed to finish my skirt, but it is all pinned and ready to sew over the weekend. 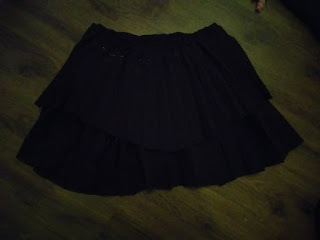 I used the existing hem so that I don't have to hem the second level of skirt meaning that I just need to hem the top layer, and sew the second layer inside. Hopefully the pleating will remain intact and it will end up looking like the upside down Reeses cup that she wears. It's not as wonky as the photo makes it look, it was just really hard to arrange the pleats for a photo. I'm still not sure about how I'll make the Redvine that she wears as a hair tie though. I need to be able to wrap it round my ponytail, which means it needs to be flexible. So I can't just make it out of clay like the other hair bits. I've honestly considered using an actual redvine (or cheaper equivalent), coating it in some sort of clear varnish, and putting some wire down the middle, but I don't really know how effective that would be. So overall my hair bits need painting, the hoodie needs dying, I need to do the tights, and then the cosmetic stuff like my hair. Hopefully by next Friday I'll have the hoodie and skirt to show you, then after that it's the tights. Luckily I already have plenty of suitable footwear to use. 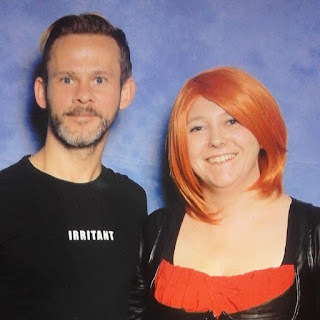 Since it's only 3 weeks to go it's time for me to have a serious think about exactly who I want to meet so that any virtual queue tickets that I might need can be prioritised as soon as I get there, plus it's about time to get parking booked and things like that. It would be cool to hear from anyone else that is going to London Film and Comic Con, and what you guys are cosplaying as. Here's another of my previous cosplays from when I went as vampire Willow from Buffy. Also, don't forget to check out my previous comic con post for a chance to win a Kaylee Frye teddy bear.